In this lesson we talk to Matt Gladfelter of Bow Ties and Hot Dogs about some of the little details of operating a hot dog cart that simply haven’t fit into our conversations to up to this point. But that doesn’t mean this lesson isn’t critically important. In this discussion we cover some operational details of working a hot dog vending unit like how long you can store product and where. We will also be diving into the details of how to cut waste, but to get tax credits for the food you aren’t able to sell. One of the advantages of operating a hot dog business is that as long as the sausages are frozen, they maintain their taste and texture for long periods of time. According to FoodSafety.gov, you can safely keep an unopened packaged of hot dogs frozen for two months. Depending on what expiration date or best if used by date is listed on the package, you could arguably freeze them even longer than that without sacrificing much in terms of quality of taste. Once you transfer your hot dogs from the commissary to the cart or food truck, you can keep the majority of the product frozen in a cooler or small onboard freezer. You can thaw out a handful of hot dogs so that you’ve got product ready to sell. If you end up getting a lunch rush, you can quickly thaw the hot dogs by bringing a pot with water to a boil. After the water reaches its boiling point at 212 degrees Fahrenheit, reduce the heat slightly and place the hot dogs in water. 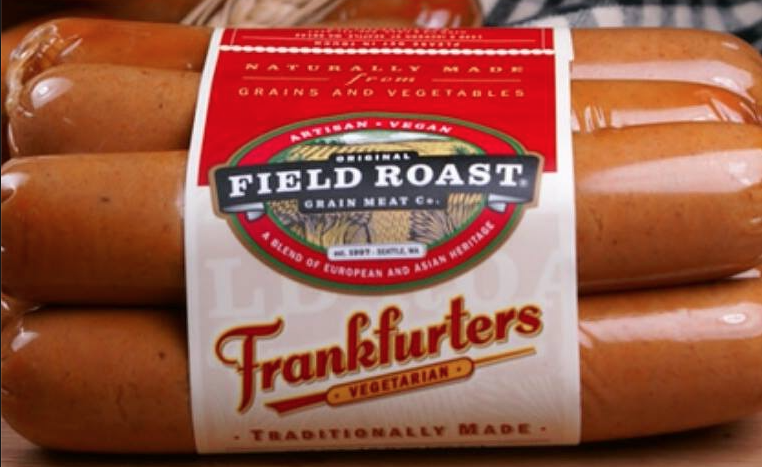 Frozen hot dogs will typically take between 5 – 8 minutes to cook. There’s another reason keeping hot dogs frozen can benefit you. If you happen to have a health inspection and your product is completely frozen at 19 degrees Fahrenheit it will make passing much simpler. Equally important to the sausage you select is the bun. The quality, taste, and texture of the bun will go a long way in determining the overall quality and uniqueness of your final product. One of the simplest ways you can differentiate your bun from places like Costco and others is to work with a local bakery to create your bun. You can also help support local businesses and get an ally for your own vending business by supporting a ma-and-pa establishment. Working with a bakery can allow you to explore a lot more taste options. For example you could do something more creative like a pretzel bun. Alternatively, you could go sweet and use a Hawaiian roll. The options to explore are limitless, but it is a very easy way to differentiate yourself. As great as working with a bakery sounds, the reality is you will also incur a higher cost per bun. It’s not unusual to go from an average cost of 15 cents per bun all the way up to 25 – 55 cents per bun by working with a local bakery. You may also need to purchase a certain volume of buns on a consistent basis to work with the bakery. You’ll need to take into consideration the brand you’re building and cost in the business planning stage of your venture. Note: In the early days of your business you may opt to just using a store bought brand initially. This will help save you money and simply the process of just getting started. Before you’ve actually gone out and started to vend in your business, you’ll be guessing as to the amount of product you’re going to need. Overtime, however, as long as you maintain good sales records, you’ll quickly learn the locations and times that bring in the most customers. Bottom line, until you actually get out there and start vending you won’t have a 100% clear picture of your inventory needs. In the early days it can benefit you greatly to have the support of a spouse or friend that can serve as a runner just in case you run out of buns or hot dogs. In a pinch, your partner can make a quick run to the grocery store to replenish your supplies if needed. Some of this will also depend on the amount of cash you have on hand. If you’ve only got a little bit of cash you start the business and don’t mind going shopping every day to stock up on inventory. As a good rule of thumb, Matt recommends keeping two full days of product on hand at anytime just to be prepared. Another item to keep in mind is that although you will save money by ordering in bulk, you need to consider what it costs to store the product. If you’re paying extra money to store hot dogs in a commissary then that will eat into your profits. It’s a bit of a juggling act and you will need to find the process that works best for you over time. 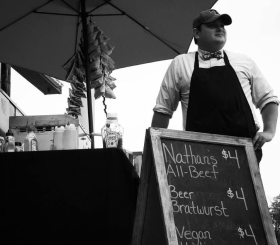 One of the recommendations from Matt is to keep about 10 cooked hot dogs on hand and ready to go while you’re vending. But keep a pot nearby that is close to boil. It should take under 10 minutes to take hot dogs from frozen to cooked in boiling water and this will help you be ready for any unexpected lunch rush without going through an excess amount of food waste. After you’ve been operating your hot dog business for a couple months, you’ll get to the point where you’ve gotten pretty good at cutting food waste. With that being said, there’s always going to be a certain amount of food you won’t sell. That’s just the simple reality of working in the food industry! Instead of throwing your extra cooked hot dogs into the trash, go ahead and put them to good use by donating them to the local food shelter. Often times, food shelters will take in the excess food you haven’t been able to sell for the day that is still good quality, but isn’t able to be served in the future to customers. By doing this you can also get tax credits at the end of the year for the donated food. This not only helps those in need in your area, but it sure beats throwing your valuable product into the trash for a total loss. When it comes to bread, I like to get the freshest bread I can get. There’s so many local bakeries you can support that would really appreciate that business. It may not be feasible when you’re first starting out depending on your income level because it is more expensive. – Matt Gladfelter on the importance of bun freshness. When it comes to food cost purchasing in bulk is cheaper. With hot dogs you’ll see that too. If you purchase a case of 200 hot dogs, your price per dog is going to be a lot lower than if you’re buying a pack of 10 or 20 or 30 dogs at a time. – Matt Gladfelter on buying in bulk. Hot Dog Business Planning – Learn how to start planning for the launch of your own hot dog business. How Much Can a Hot Dog Cart Make? – Find out how much revenue you can really generate on a hot dog cart.